This is spectacular. It’s not often you get to see underneath the bottom of a glacier. The glacier sits on top of the last volcano to explode on Canadian soil: Mount Meager, northwest of Whistler, B.C. But the fact that it erupted just over 2,400 years ago does not mean it’s past its potential to blow again. That’s just the blink of an eye in geological terms. 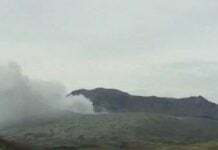 Now, the combination of the volcano and its shrinking glacier has drawn scientists to read the signals, the body language of the mountain in hopes of knowing when the next eruption will happen. The melting ice is indeed increasing the chances of a landslide or an eruption. 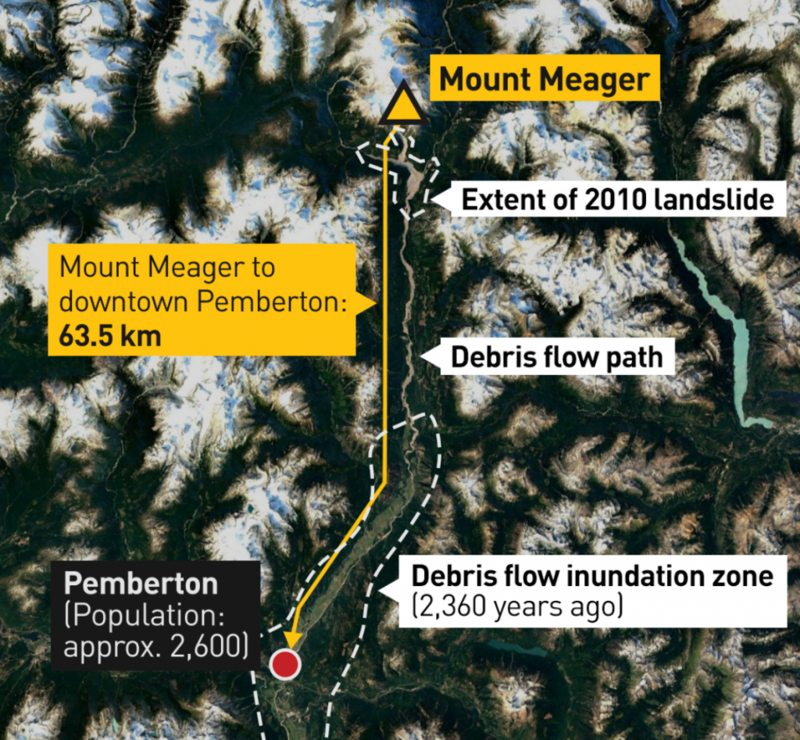 Mount Meager, he believes, is cracking, collapsing and potentially threatening the safety of people who live in the region. Two years ago, a helicopter pilot spotted something as he flew over the mountain. There were three holes in the glacier and something was belching out of them. Volcanologists confirmed that the holes were fumaroles — vents that spew a mix of steam and toxic gas from the underlying volcano. They had emerged because the ice is shrinking. When his team’s helicopter landed on the glacier that day in September, the smell of rotten eggs filled the air. It was hydrogen sulfide, mixed with carbon dioxide and steam from below, which produced a ghostly churn of mist. In the open air, the smell is unpleasant, and the gas may cause headaches. The greater danger is getting trapped in an enclosed space — a crevice or crack — where concentrations of the gas can knock a person unconscious and, at worst, kill them. 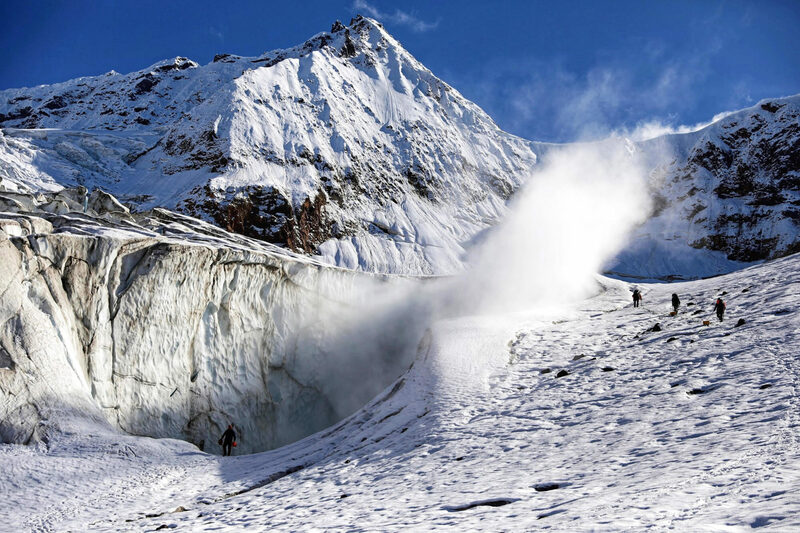 The team is researching not only the gases and the expansion of the fumaroles, it is also measuring the speed of the glacier’s retreat and the potential for a landslide, which could trigger an eruption. All of those factors combine to create instability and uncertainty about when disaster might strike. Scientists are certain Mount Meager will erupt again. They just cannot say when. Mount Meager is one of a string of volcanoes reaching up North America’s west coast between Northern California and Alaska. 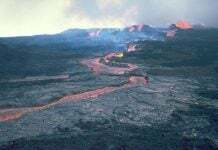 They include Mount St. Helens in Washington state, the site of a deadly eruption in 1980. Fifty-seven people died when the north face of the mountain collapsed, triggering an eruption. In its intensity, it mirrored the last volcanic eruption on Mount Meager so long ago. In this case, it is the people who live in the nearby Pemberton Valley who may be in harm’s way. There are about 5,300 residents spread through three communities living within about 60 kilometres of the mountain. The risk is not immediate, but an eruption could be devastating. The more immediate concern is potential landslides. Gioachino Roberti, a PhD student on Williams-Jones’s team has studied the cracks on the massive rock face of the mountain and has deemed the risk to life “unacceptable.” As he stood on the glacier, Roberti swept his left arm upward, pointing to a nearby peak. “It is very likely this slope will fail very soon,” he said. There is a visible crack in the rock, and the flank is moving a few centimetres each month, he said. Roberti does not have to imagine the impact of a slide. He simply has to look back at what happened on this mountain eight years ago when nearly 50 million cubic metres of material crashed down the mountainside in 2010. The debris travelled 13 kilometres — destroying bridges, roads and equipment. 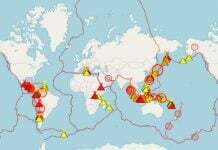 Seismic waves were felt as far away as Alaska and Washington state. An alarm began sounding, warning of gas, but the concentration of hydrogen sulfide was not enough to warrant turning around. When they got closer, Williams-Jones could not quite believe his eyes or contain his excitement. The ice had split apart, revealing what appeared to be the bottom of the glacier about 30 to 40 metres beneath its feet. You don’t get to see that everyday. That is amazing. It’s as though someone took a laser and melted the middle of the glacier. 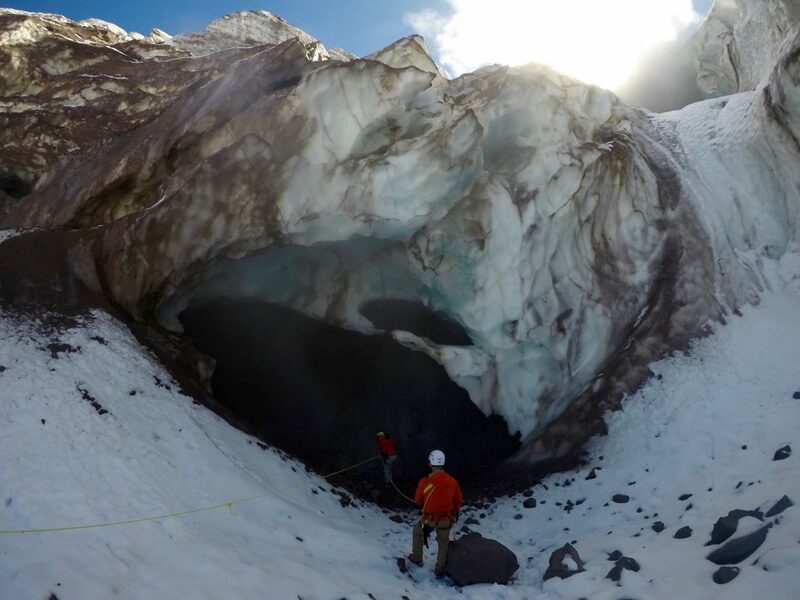 The ice cave discovery underscores the increasing instability of the volcano and the need for 24-hour, all-season monitoring and alarm systems to warn of landslides or even an eruption. Volcanoes are enigmatic. Each one has its own personality. Mount Meager is quiet but grumpy. I don’t want to be seen as a fearmonger. I’m not saying the sky is falling, but I have to say, Look, this is important. 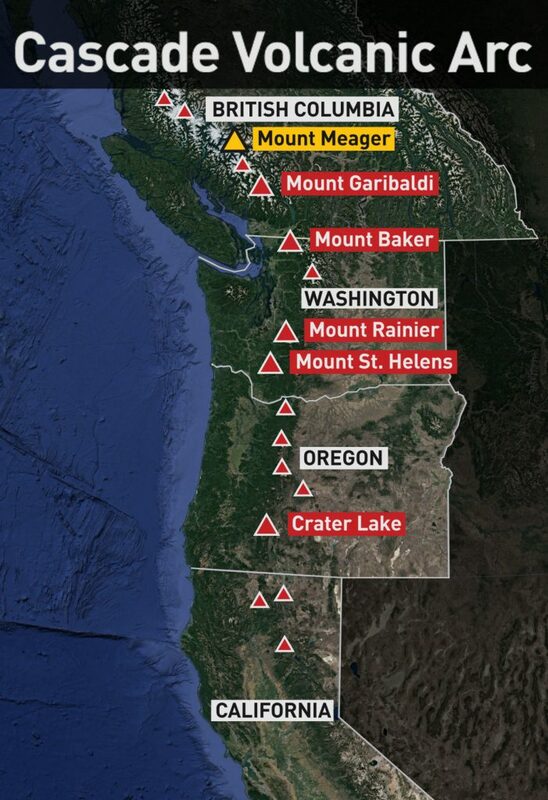 The next big eruption landslide of Mount Meager volcano will be cataclysmic. Be prepared! That whole West Coast is littered with volcanoes, eh?